Waterfront property is unlike any other type of property. It carries a unique beauty and versatility, since you’re getting land and water at the same time. However, it can also be more complicated to buy than land-locked real estate. Inspect carefully and comprehensively. Water might be easy on the eyes, but it’s hard on a building. Whether you have water intruding into the basement from the high water table, corrosion on your exterior because of salt air, or mildew and mold issues from higher moisture levels in the air, an expert inspection can help you understand what you might be up against. Surveys, elevation certificates, water quality tests and other land- and water-based inspections that you might not have done on a regular house can be very important with waterfront property. Choose the right water. Waterfront property isn’t all the same. If you want the smell of salt air, there’s no substitute for beachfront property, but if you want to hear crashing surf, a property on a bay might not be the right place for you. Property on a large lake gives you the ability to sport about in a powerboat, but if you want peace and quiet, you might be better served by being on a smaller body of water that’s devoid of noisy powerboats and peering eyes. Walk the property carefully. Spending some time on the water helps you see if the property is as good as you think. For instance, you could have a beautiful view, but not have good access to the water. On the other hand, the lake that looks fantastic from the window could actually be choked with weeds and debris. When a house has an unattractive backyard, you can change the landscaping. With a waterfront home, you’re also buying the water, so getting it right is crucial. Check insurance requirements. Waterfront properties frequently have an increased risk of flood damage and some beachfront homes are also at risk of hurricane or even earthquake damage. If insurance is available, it could be cost prohibitive, so it’s best to know before you sign a contract. Look for hidden costs. Waterfront properties can sometimes carry additional expenses that buyers might not be aware of. For starters, water and sewer rates can be more expensive than inland rates. Boat dock and lift fees as well as septic tank and well upkeep are additional potentially hidden expenses to inquire about as well. Research the shoreline’s history (and future). Water and dirt mix in interesting ways and, sometimes, the shore moves. If the water level goes up, you could end up losing your property. If the water line moves away, your waterfront home could end up being a quarter-mile walk from any water. Look for a deal. For many people, owning waterfront property is a dream come true. For others, not so much, which can create some extremely motivated sellers. If you can find a motivated seller and move quickly, you just might get a great deal in helping that owner get rid of his problem. Consider supply & demand. On the other hand, if there are too many properties on the market at prices that seem like they’re good deals, it could be a sign of a weak market. Either way, consider what’s most important to you in your buying decision before moving forward. Devise a strategy for the property. If you’re going to live full-time in the property, searching for a lakefront primary home is one strategic buying approach that you can take. On the other hand, if your waterfront property is going to be a vacation home, you might want to look into whether or not you can rent it out when you aren’t using it. Doing this can help to lower your cost of ownership while also keeping the house from sitting empty for too long. Work with an expert agent. Waterfront property isn’t simple. Between the title issues, the structural issues and the unique way that the market looks at the property, many real estate agents can’t effectively help you through the purchasing process. A real estate agent that specializes in waterfront homes and land will know which questions to ask, who to involve in the transaction, and how to help you achieve your dream of home ownership on the water. Thanks for sharing some tips for buying a waterfront property. You make a good point about how important it is to choose the right location. It makes sense that there are a lot of things like smell, activity, etc. to consider. I really want to buy a beachfront property, so I will have to find a good real estate agent who can help me find ones to fit my ideas. I assumed that waterfront property would have it’s own unique considerations so this website has been helpful in my research. I’ll have to use these tips when inspecting the house for water damage. Also researching the shoreline’s history is something I’ll have to do before a waterfront property purchase. I really like your tip about making sure that you choose the right water. My husband and I have been wanting to live on the lake for a long time now. We have been looking at a lot of different homes for sale so we will be sure to keep these tips in mind while we are doing our searching. Hopefully, we will be able to find something that suits us, thank you for sharing! I appreciate the tips on getting waterfront property. I agree that not all waterfronts are the same so you have to make sure you are where you want to be when it comes to what type of water you want to be around. My brother is in search of a waterfront apartment, I will be sure to share these tips with him. I have always wanted to buy a waterfront property. I appreciate the tips you have here, especially the one about looking for hidden costs. I wasn’t aware that waterfront properties can have more hidden costs, so I will remember that. I have always dreamed of one day owning a lakefront property! In order to make sure we make the right purchase, I will be sure to keep these tips in mind. I thought the tip about researching the shoreline’s history (and future) was especially insightful. You included so many things I hadn’t even thought of! Thanks for sharing! Many people underestimate the costs required of the upkeep of owning a waterfront property. You may find a ‘great deal’ on a property with no dock and no seawall/retaining wall. In lakefront properties, you may find yourself having to expend A LOT of money to get it all ready for boating and lake activities. This is of course no problem at all if you have it budgeted, but its important you know the cost before signing the contract. Also, like in point #10 always consult a local experience real estate agent versed in waterfront properties who will help with point #9, a strategy to make sure your investment is a good one! Whether you plan to live in the home longterm or use it as an investment property, always consult an expert! And sometimes it may be worth it to get a second opinion. 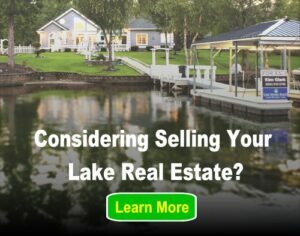 Consult great resources like lakehomes.com too when you are considering buying a lake home! I like your idea of how you would need to walk the property before you buy a waterfront home. I would imagine that you would want to find somewhere that has a nice property. I’m looking to buy a waterfront vacation home so I’ll have to choose one that I’ve inspected carefully. I have always dreamed of owning a waterfront home. My husband and I are currently looking into finding a home, but we want to make sure we make the right decision. As you explained, it’s important to choose the right water. I have always loved the salty air and crashing waves, so we might look into going toward the eastern shore. Thanks for sharing! Thanks for the advice about finding a motivated seller to buy a waterfront property from. I didn’t know that that is a good thing to do, so I’ll make sure to try it when we start our search for the perfect lakeside home. I think it may be a few years before we can really start looking, though, because my husband just barely got a new job in this area and we don’t want to resettle so quickly. Maybe once he retires, we can really put some time into searching. My husband has been asking me to buy a home on the lakeside, but I’m always nervous to. I caved though this week when I looked up a few houses, they were absolutely beautiful. I just hope that we’d be able to cover the right insurance, and possibly do some research on the back ground of the home. I agree that you want to check the insurance requirements before you buy a waterfront home. It would be smart to know if there will be added costs to your instance for having this type of home. It has always been a dream of mine to own a waterfront home, so if I ever get the chance to I’ll have to check the insurance rates as well. My wife and I have been thinking about vacation homes for sale, and seeing if we could get a place for our family in the future. I like how you talked about working with an agent who is an expert in finding vacation homes for sale. I think that if we can find a great agent to help us find the right vacation homes for sale that we want, we’re going to be very happy with the purchase! Thank you! I want to make sure that I invest in the right property. It makes sense that a waterfront property would be a good idea! I’ll make sure that I inspect any before I buy them. That way I can ensure that they aren’t in danger of the water that they’re next to. It might be your last tip but it’s my favorite one – work with an expert agent. I liked how you expounded what you said that a real estate agent who specializes in waterfront homes know which questions to ask. Buying a waterfront property is one of my dreams and I finally have the plan to do it. This is going to be one of my investments so I want to make sure to work with the best. I’d make sure to remember your tips. This is a nice article, I like the tips that were given and how the description of each tip were not overly wordy. Good read for people looking to buy a waterfront home. You make a good point in explaining the benefit of careful inspection of the property when buying a lake house to check if there’s corrosion on the exterior because of salt air, or mildew and mold issues from higher moisture levels in the air. My husband and I are planning on purchasing a waterfront home, and it’s good to know that an expert inspection can help you understand what we might be up against. Thanks for the tips! My husband and I are thinking of buying property by the water. I appreciate your advice that we should make sure to spend some time on the water to see if that property is really as great as we think it is. This would really help us to know whether or not to buy in that area. I quite sure this piece wasn’t written based on guessing. It is a perfect article and informative. Thanks. I’m glad i hop over to read. My wife and I have been thinking about moving. I want to get some waterfront real estate for sale. I think that it would be a good idea to research the shoreline history. I like that you pointed out that we must check the insurance requirements. Like you said, this will ensure that we are protected when the area is passed by a hurricane or when there is an earthquake. I will definitely check this to ensure that we will not worry about the expenses we will have for repairs and restorations. Now, I just need to start looking for listings and agents to help us out since we already have the money we were waiting for to buy one.